Fifty years ago today, John Fitzgerald Kennedy was a 43-year-old man who took the nation, and the globe, by storm. He had a narrow electoral win over Richard Nixon, and all of his Hollywood friends (including one Francis Albert Sinatra) were ready to celebrate. But first, there was the little matter of the inaugural address. 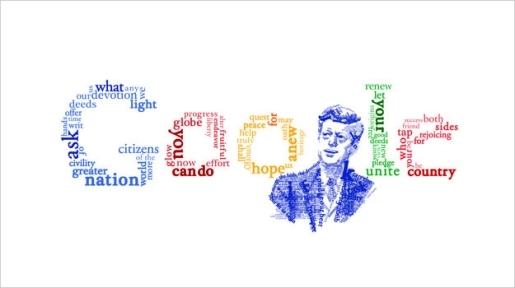 On January 20, 1961, John F. Kennedy made his most famous speech to the world, and today, Google is honoring the 50th anniversary of JFK’s inaugural address with a special-made Google Doodle. Several people contributed to the speech, including Harvard economist John Kenneth Galbraith, but most of the heavy lifting was done by Theodore Sorenson, Kennedy’s primary speech writer, and Kennedy himself, who liberally peppered his speeches with famous quotations from other speakers. Perhaps then it’s fitting that the words are what gain the greatest emphasis in Google’s JFK Doodle, not the man himself. After all, the words of the speech are are memorable as the man who delivered it.